Ask anyone Irish and they’ll tell you music is in their blood, and so it is with Blackwater Conspiracy from County Tyrone, Northern Ireland. Their debut album “Shootin’ The Breeze” was released June 2017 in the UK to wholesale critical acclaim. Festival slots at Download and Ramblin’ Man Fair followed and then a high octane tour supporting Tyler Bryant & The Shakedown closed the year out on a high. 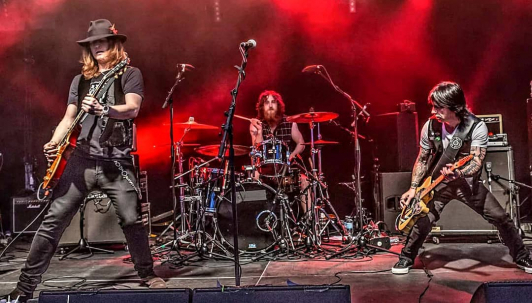 With more touring in the pipeline Blackwater Conspiracy will hit the ground running in 2018 and continue spreading their heady musical cocktail for more to discover. The story of the band is the story of 5 guys from Northern Ireland who have played music all their lives. Having crossed paths frequently over the years they came together as Blackwater Conspiracy in the Summer of 2015, formed from the ashes of two of the country’s most popular local bands, Million Dollar Reload and Swanee River. Their intention from the outset was no more following of trends, no more conforming to what was expected – they are 5 individuals wanting to fully express themselves whilst playing in a band. Sounds simple, but consider a classically trained pianist taking inspiration from Jon Lord and Jerry Lee Lewis, a bass player influenced by Iron Maiden and Thin Lizzy, a drummer driven by everyone from Buddy Rich to Danny Carey and two guitar players oozing The Stones, The Faces and The Black Crowes – you’re going to create a pretty unique musical melting pot. Songwriters Phil Conalane and Brian Mallon take a refreshingly free-form approach to their songs, thus allowing all this individual expression to take place. The result is a breathtaking panorama of material – from rich bluesy slide guitar rock to achingly delicate confessional country; from galloping radio friendly rock ‘n’ roll to late night dark corner whiskey blues. The band play with a confidence and effortless ease, the arrangements are epic and it’s all woven together with one of the most naturally expressive classic rock voices in the world today. Like the River Blackwater, the geographical link that ties each member together, and from where they take their name, there is an unstoppable flow, a natural power and order of things present here – this is the essence of Blackwater Conspiracy.